We’ve been hard on the six-month downloadable content roll-out for Batman Arkham Knight, because, so far, it just hasn’t been that good. The newest morsel, released yesterday, isn’t much of an improvement, but this month does bring promise of a potential turnaround. If it looks like more of the same, well, it is. Arkham Knight already has more than a dozen challenge maps and the areas these new ones are set in don’t appear to be new. The novelty here is that some of these challenges are designed for you to play as Robin, Nightwing or Catwoman. You get what you pay for, and maybe for $2 you can’t expect much more. You might have expected a game as polished and as long-in-development as Arkham Knight—a game developed with clear Game of the Year aspirations—to have something great in its DLC offering. Not yet. But maybe that’s coming soon. ... and an adventure for Nightwing called GCPD lockdown. 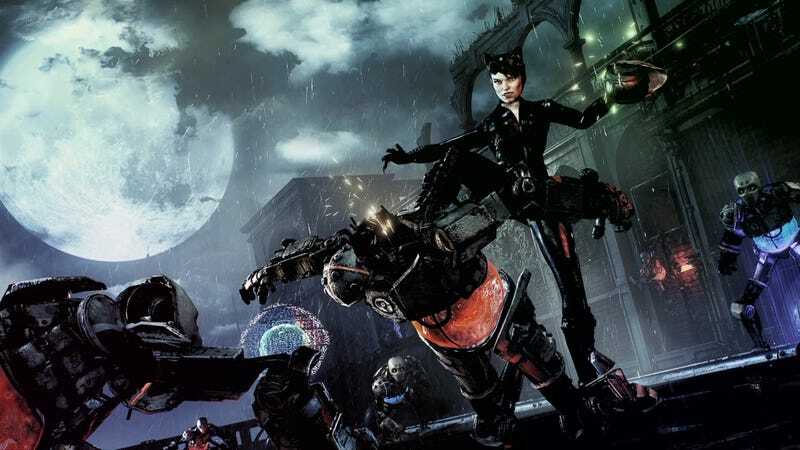 The latter may tell the tale of the game’s six-month DLC plan, for good or ill. GCPD Lockdown could be as thin and ultimately dissatisfying as the Arkham Knight side adventures already released for the game, the ones that let you play as the Harley Quinn, Red Hood and Batgirl, and all of which one of our in-house Arkham experts played and panned for being dull. On the other hand, it’s the first major piece of DLC for the game that will have been made by Rocksteady, the studio behind the base game. The other DLC adventures were made by WB Montreal, a studio that has produced some good stuff, but just not good DLC for this game. Beyond the Nightwing DLC, Arkham Knight is supposed to eventually get something called The Season of Infamy, a villain-centric expansion that could make this six-month-DLC-$40-Season-Pass program all worth it, or could just give us a better phrase with which to describe this entire six month endeavor. Hoping for the former.